I wanted to know how well the MKH 8020s in a DIY closed-cell-foam SASS compared with four other stereo rigs, when used for recording birdsong and wildlife sounds. The MKH 8020s in DIY SASS rig was the equal winner with AT4022s in Crown SASS. The runners up were all good, with varying chacteristics. * MKH 8020s in DIY SASS had a full range of sound with very little noise, and could be further improved for birdsong recording with simple EQ to match the brighter profile of the EM172 rig (see end of this article for the EQ used). * AT 4022s in Crown SASS were very low noise and had an excellent sound without needing to add any EQ. * EM172 electrets in DIY SASS (SASS Lite) had a lovely sound, ideal for birdsong, but does have some grainy hiss. * MKH 20s in Crown SASS used with diffuse field switched on, was good but had more noise than both the 8020s and AT4022s. * AT4022s in DIY Olson Wing, angled slightly downwards as recommended by its inventor Curt Olson, had very low noise but sometimes missed out on picking up some of the higher frequency details, possibly because the rig was not pointing directly at the birds. It did not have quite as precise directionality as the SASS rigs but could still produce some lovely recordings. For the phantom powered mics I used a Sound Devices 702 recorder with recording level set on 57.2 and minimum low cut, also a Denecke phantom power unit running to an Olympus LS10 recorder with recording levels set on Low sensitivity volume 10, no low cut. I swapped the mics around so that each set was powered alternately by Denecke, then SD702, because the Denecke-LS10 setup did add a bit of extra noise. Sometimes I used consecutive recordings with 2 different rigs alternating to the SD702. For the EM172 rig I used the plug-in power of the LS10 to power the EM172 mics, and probably using low sensitivity volume 10 on the LS10. Where necessary levels were matched in post but no filtering was used. In the field, rigs were covered with lycra and furry windshields. 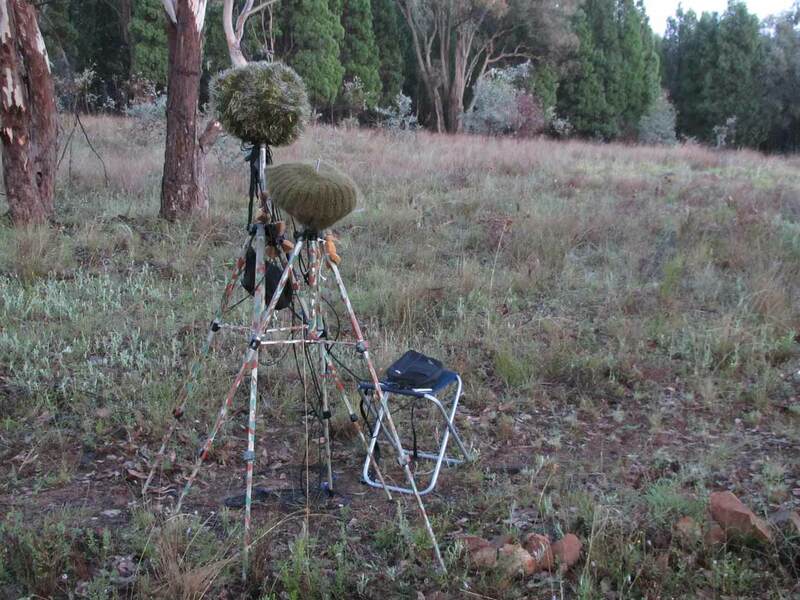 Pictured is a typical field recording setup, the two rigs are on tripods, close together, one is above and behind the other so as to block as little sound as possible. The rigs are wearing knitted green furry windcovers. The SD702 recorder is on the stool, while the Denecke-to-LS10 is hanging from a tripod. In a comparison of simultaneous recordings the EM172 rig compared very well to the 8020s but was noticeably hissier in the mid-range. The EM172s were slightly brighter and did not pick up as much of any distant low traffic roar that can sometimes be present with the 8020s. With minimal EQ (see below) the 8020s recordings could match the brighter sound profile of the EM172 rig without adding any more noise. Simultaneous recordings were made with MKH 8020s in DIY foam SASS running to Sound Devices 702, versus Audio Technica 4022s mounted in a foam Olson Wing, running to a Denecke phantom power unit and an Olympus LS10 recorder. Even running to the (noisier) LS10, the 4022s are a bit quieter than the 8020s, but they did lack some of the lower frequencies (e.g. useful for the wing sounds heard in this recording), and the stereo image is not quite as precise. The lack of lower frequencies was more a characteristic of the 4022 mics rather than of the Olson Wing. sonogram close-up (below), first half 8020s in SASS; 2nd half 4022s in Olson Wing. AUDIO & SONOGRAM: first half = MKH8020s in DIY SASS to SD702; second half MKH20s in Knapp-modified Crown SASS to SD702. Consecutive sequences, mostly crickets. The sonogram shows a mole cricket at 2.4 kHz & a field cricket at 4 kHz. The high pitched sound at 15 kHz is of electrical origin. For this test I made consecutive recordings rather than simultaneous, and used only the SD702 for recording. The evening crickets provided a constant sound level, and I set up the rigs on my verandah, recording for several minutes with one set of mics, then swapping over to the other. The 8020s had less noise and sounded more open and transparent. A daytime test from the verandah had similar results. Consecutive recordings (rather than simultaneous) were made with both sets of mics SASS-mounted (4022s in Crown SASS), and alternately running to the SD702 recorder. I needed to add 3 dB to the AT4022s in post, to match the levels of the 8020s. In this particular recording it is almost impossible to pick by ear the differences between the two rigs. Looking at the spectrograph however, you can see there is actually a little more noise in the 8020s. In other recordings I noticed that the 8020s were more prone to picking up ‘distant traffic roar’, and that the 4022s were perhaps a little brighter. 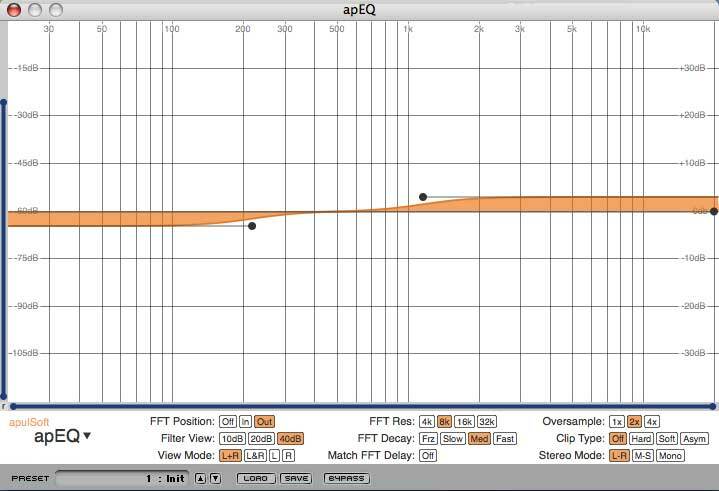 These EQ settings in apulSoft apEQ (now known as apQualizer), could be used to brighten the sound of the 8020s, and to knock back the lowest ‘distant traffic’ frequencies a little. High shelf and low shelf filters were given a 3 dB shift above and below 500 Hz. Of course if you were recording thunder you would not use this EQ! Other issues with all of the above rigs included weight of the rig and reliability. The Crown SASS is the heaviest rig and for that reason is the one most likely to be left at home. I intend to build a foam SASS for the AT4022s as I like their sound in a SASS unit better than in the Olson Wing, and better than the MKH20s. Most reliable have been the EM172s which have been left outdoors in heavy dew with no problems. The MKH20s have also been reliable. The AT4022s have been giving a few soft popping sounds when recording in high humidity. The 8020s have had many issues and I am now (2011) up to my 3rd replacement pair from Sennheiser who have acknowledged there was a design problem. They say the housing of the 8020s has now been redesigned and in a couple of weeks of testing, often on dewy mornings, I have not yet had any more problems. Fingers crossed! In mid-December 2011 I received my 3rd replacement stereo set of MKH 8020s from Sennheiser, ‘a newly manufactured batch of mics with a completely redesigned housing’ they said. And as at June 2012 (with limited use) I have not had any further fizzing problems. 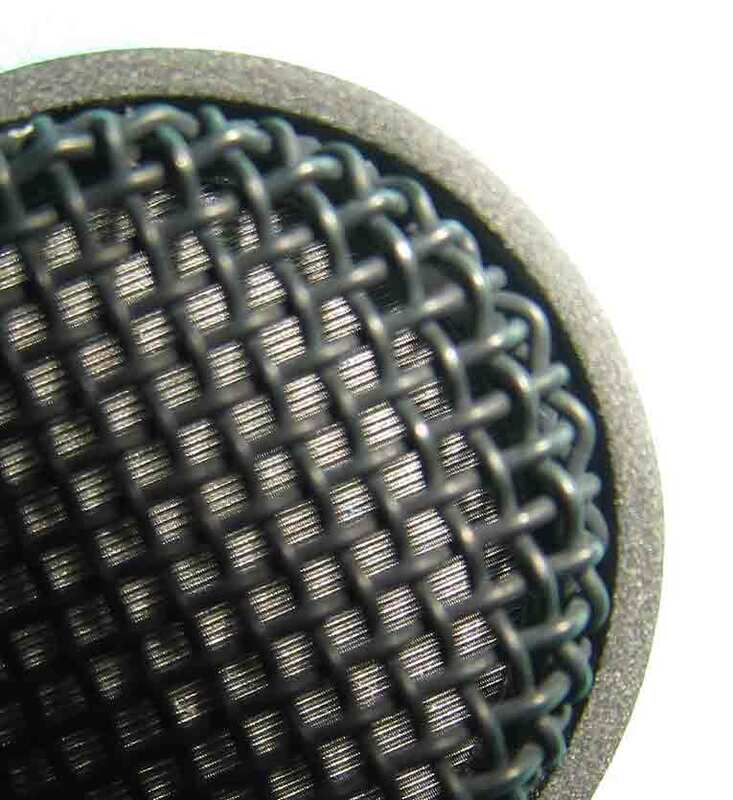 The only external difference I could see with the new mics was that the diaphragm of the new batch is textured, whereas the earlier versions of the mic had a diaphragm that was smooth and shiny. So if you are thinking of purchasing an 8020, check the diaphragm to see if it is from an old batch (shiny), or from the most recent batch (textured). So far as I know, Sennheiser did not recall the 8020s so there may still be faulty ones for sale. See more DIY recording gear on page 4! This page was written in 2011-12 and last updated 31 May 2017.